Arizona Mills is often promoted as an outlet mall, and there are outlet stores here but not all of them are. Are they cheaper? Sometimes yes, sometimes no! Arizona Mills is a favorite with the younger crowd; it has a reputation for being loud and crowded. Easy access by public transportation may be one of the reasons this is a favorite hang-out mall. There are about 170 stores and restaurants at Arizona Mills. Eateries include Claim Jumper, 5 & Diner, Joe's Crab Shack, Garcia's Mexican restaurant, in addition to a large food court near the movie theaters. Arizona Mills is arranged in 6 "neighborhoods." It can be a long, circular walk if you park in the wrong neighborhood! Harkins Arizona Mills is a 24 movie theater megaplex. There is an IMAX theater at this mall. 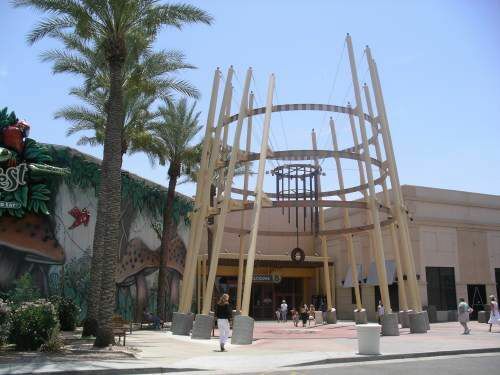 Opened in May 2010, Sea Life Arizona Aquarium is located on the north side of the mall. Arizona Mills is located in Tempe, at Baseline and I-10. Check out the map. The Arizona Grand Resort is just on the other side of I-10 on Baseline. Arizona State University and downtown Tempe are a few miles away. Enjoy these photos of Arizona Mills in the Shopping Mall photo gallery. Stores and restaurants open and close, as do mall programs and other features. With specific questions about the mall, visit Arizona Mills online.